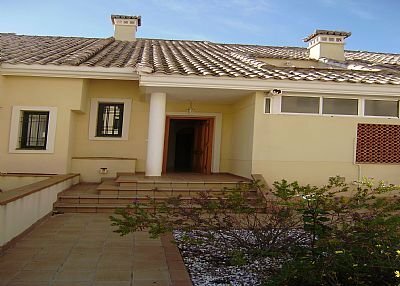 This new fully furnished 3 bedroom house is within the gates of the Royal Golf club, Lomas De Campoamor. It is set amongst beautiful landscaped gardens and is just a short walk to the wonderful clubhouse, bar and restaurant, which is set at the highest point of the development. From here you can enjoys stunning,far reaching views over the golf course, to the countryside and coastline from La Zenia to the Mar Menor and La Manga. The large house, in a small row of just 6 houses has 3 large bedrooms with 2 superbly fitted, fully tiled bathrooms. It will sleep up to 6 adults and has a well equipped kitchen. The living room is large, with separate dining area. The living area and master bedroom is air conditioned. There are patio doors leading to a sun-terrace with views to the communal landscaped gardens and surrounding countryside. There is a further sun-terrace offered upstairs. There is also the use of a large communal swimming pool with sun bathing area and fresh water showers for residents and guests. The house is furnished to a very high standard with British TV available at no extra cost. The greens and fairways of the excellent 18 hole championship golf course are 10 minutes away on foot. The Campoamor area is a haven for golfers with Las Ramblas golf course just 300 yards from the main gates of Campoamor golf club. Villamartin and the new Las Collinas golf courses are less than a 10 minute car ride away. There are also other golf courses only a short drive away from the apartment including La Finca and La Manga. For the non golf player there is plenty to do and many places of interest in the area to visit. The house is situated in a very peaceful and tranquil part of the Costa Blanca. The La Fuente Center opened a few years ago. There is a choice of several bars and restaurants within walking distance. More restaurants are opening each year and there is no longer the need to travel to Villa Martin, La Zenia or Cabo Roig . Many of the restaurants have live entertainment during summer and the Stray Sod has entertainment through out the year. There are Fantastic beaches to enjoy are all within a short drive (all around 5 minutes by car or taxi). For an even livelier evening Torrevieja is not far away and has plenty of tapas bars, restaurants and night clubs. There are some excellent shops and a huge outdoor market held every Friday morning at Torrevieja, with over 1000 stalls selling almost everything from food to clothes and household goods. Saturday is Playa Flamenca Market just a few minutes drive away. The recently opened shopping centre La Zenia Boulevard which is 5 minutes from the house makes the trip to Torrevieja unecessary. There are a number of activities close to the house, including Tennis, Go-Karting, Golf, Bicycle hire, watersports, Aqua park and horse riding. There is also a play area near the hotel and clubhouse for younger members of the family. The house is situated on a truly stunning development and it is in an excellent position to explore both the Costa Blanca and the Costa Calida, with car hire prices in the region being very inexpensive. A visit to the nearby city of Elche / Elx is recommended. The house is easily accessible from both Alicante airport ,50 minute drive and Murcia (San Javier) airport, 20 minutes by car. Airport pickups can be arranged if you are not intending to hire a car at the airport.